Whether your kids beg you every year, or it's on your bucket list this holiday season, making a gingerbread house isn't as difficult as it might seem. With the right recipes, tools and techniques, it's a snap, and fun for the whole family. Side View of Gingerbread House 2009. 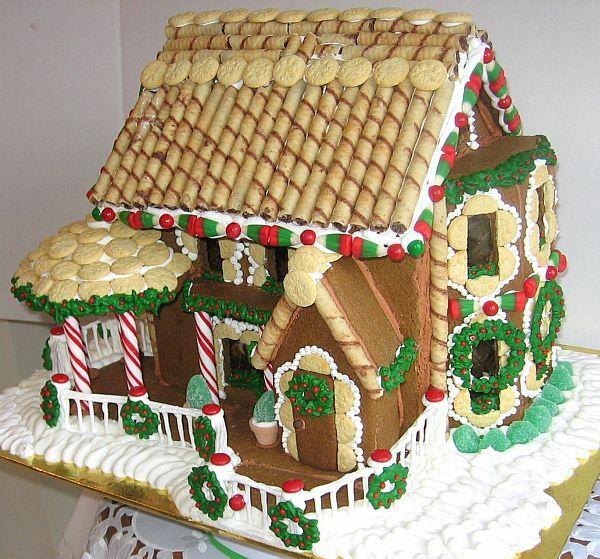 © 2009 Barbara Rolek licensed to About.com, Inc.
From fancy to farmhouse, you can make your gingerbread house any way you imagine. Here are a few ideas to follow or inspire, from the more simple to the colorful and elaborate. You may select a style based on the type and amount of candy used or the level of difficulty. Gingerbread dough should rest 30 minutes before rolling. © 2008 Barbara Rolek licensed to About.com, Inc. This economical recipe is for "structural" gingerbread, meaning, while it's edible, it's meant for building, not for eating. With only five ingredients and no unique spices, this dough is something you can probably put together without running to the store. Although it doesn't need to rise, the dough should be left to sit for 30 minutes to rest. And it is best if baked one day and assembled the next. Gingerbread House Made with Betty Crocker's Gingerbread Cookie Mix. © 2008 Barbara Rolek licensed to About.com, Inc. This limited edition mix (don't confuse this with Betty Crocker's Gingerbread Cake and Cookie Mix) makes great houses. The dough bakes up sturdy enough to support lots of candy and icing—and it is a real time saver. You only need to add three ingredients—butter, egg, and water—and the dough rolls nicely and cuts easily. A simple three-piece pattern. Cut two gable sides, two long sides and two roofs. © 2008 Barbara Rolek licensed to About.com, Inc.
Perhaps one of the most challenging steps in making a gingerbread house is creating the template—making sure you have all of the measurements correct and the pieces are proportional. The beauty of the internet is that you can find a variety of house patterns to pick from! Just print and cut out the designs, transfer to lightweight cardboard, place the templates over rolled-out dough, and cut. Use a nonserrated pizza wheel or pastry cutter to cut out the patterns. © 2008 Barbara Rolek licensed to About.com, Inc.
Uneven, sticky dough can make rolling and cutting it very frustrating. By following these steps you will have your gingerbread house pieces in no time. By rolling out the dough onto parchment paper you won't have to worry about it sticking to a pastry board or countertop. And using a pizza cutter makes cutting a breeze. Nothing is worse than watching your completed gingerbread house come tumbling down, so it is important that you use a reliable "glue" to keep the pieces together. Royal icing, a mixture of sugar, egg whites, and cream of tartar, is essentially the mortar that will keep the walls intact and the roof on top of your gingerbread house. It is easy to make and comes out perfect every time. Use a plastic coupler and ring for ease in changing pastry tips. © 2008 Barbara Rolek licensed to About.com, Inc. This isn't really the best time to use a short-cut and try the zip-top bag method (where you just snip a corner, fill the bag with icing, and squeeze)—you need to be more precise, and that's where a pastry bag, coupler, and icing tips come into play. Plus, the different tips allow for more creative decorations. If you are new to using a pastry bag, no worries—these step-by-step instructions show how to fill and use a pastry bag with ease. Have all your equipment at the ready before you begin to assemble a gingerbread house. © 2008 Barbara Rolek licensed to About.com, Inc.
Before you can begin assembling the house you need to choose a base—a cardboard cake round works well. Then pipe an "L" of icing and secure two gingerbread house walls. Continue with the icing—piping between the cookie pieces as well as on the base—until you are ready to attach the roof. Let the house dry before beginning to decorate. Beauty is in the mind of the beholder. Kids usually like to overload their houses with candy, so let them. © 2008 Barbara Rolek licensed to About.com, Inc. Here is where it gets really fun—let your imagination run wild! Or have the kids show their creativity! It's best to lay out all of the candies ahead of time and have a general idea of what you're going for. These step-by-step instructions for decorating a gingerbread house are merely a guide—follow them exactly or let them inspire.